Organic. Brisk gunpowder green tea with naturally sweet spearmint. 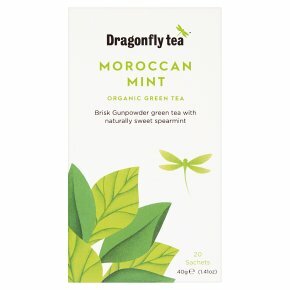 An authentic blend of bright and vibrant spearmint leaves and Gunpowder green tea, inspired by Morocco's rich tea-drinking tradition. Served all day and with meals, in Morocco every cup of this naturally sweet and wonderfully reviving tea is said to be a refreshing surprise. Brewing Instructions For a perfect cup allow fresh, boiled water to cool a little. Infuse for 1-2 mins according to taste.